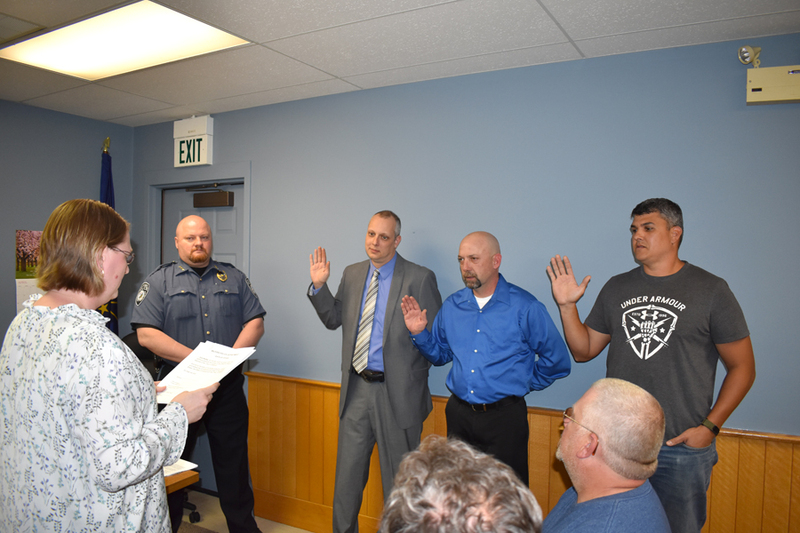 MILFORD —Milford Town Council’s two hour public meeting Monday, April 8, included the addition of four new police officers, bringing the town’s department back to full strength. The council also looked to the future with the purchase of a GIS mapping system, which will aid in the development of Milford’s infrastructure for generations to come. In March, Derek Kreider took over as Milford police chief, succeeding Travis Marsh. “The transition is going good,” he commented during police reports before introducing four new officers to the council. Eric Kelley, described as “road ready” by Kreider, will start immediately as a full-time officer. Two new reserve officers are Marcus Boyer and Sergio Soto. Former Syracuse police officer Joe Denton will work part time for Milford as an evidence technician. “He is one of the best in the county,” said Kreider. Also during police reports, the council approved $28,718 for a 2019 Dodge Durango from Button Motors, Kokomo. The price after installation of lights, siren, cage and other accessories will be $36,927. Kreider is still pricing on-board computers, however. The council also agreed to pick up the tab for Lt. Tim Miller’s school resource officer training at French Lick Springs, July 14-18, at a cost of $1,695. As per a prior agreement, the council also voted to pay Cops Gear $585 for the radio from the 2010 squad car. An amount of $1,104.15 was approved for a fire-rated Quality safe from Dunham’s Sports for the storage of firearms and ammunition. Lastly, Kline Excavating will correct drainage problems at the police gun range at a price not to exceed $1,500. Michael DeMory of 39 Degrees North, GIS consultants and application developers, held a brief presentation, demonstrating how Milford could benefit from geographic information systems technology. DeMory showed a digital projection of a map of Milford, which included two points he had mapped earlier in the day using sensing equipment, one of which was a manhole. Using the software, he demonstrated how information for the manhole — depth, condition, creation date, lid size — could be attached and stored in the Cloud. In one day, he asserted, as many as 100 points could be mapped, complete with audio, video and photographic information. Superintendent Steven Marquart informed the council he has been researching the technology for three years. The technology, he said, “would eliminate the guessing game I inherited.” Marquart has depended on inaccurate maps, many several decades old, to locate underground assets, often under snow and other adverse conditions. Marquart noted the system would provide “significant savings of hours,” and provide information necessary for obtaining additional government funding and grants. Milford hopes to map water, storm and sanitary systems, as well as the Milford Cemetery, which may come under the management of the town in the near future, said Rebecca Alles, Van Buren Township Trustee. The council approved the purchase of hardware, software, set-up and mini iPad at a cost of $12,902. There will also be a yearly fee of at least $750. During fire reports, Chief Todd Haines told the council the department missed a fire call due to a repeater damaged by a windstorm. He is seeking a K21 grant for a generator at the water tower to prevent future outages. The council approved $1,817 for Middlebury Electric to perform electrical upgrades at the fire station.